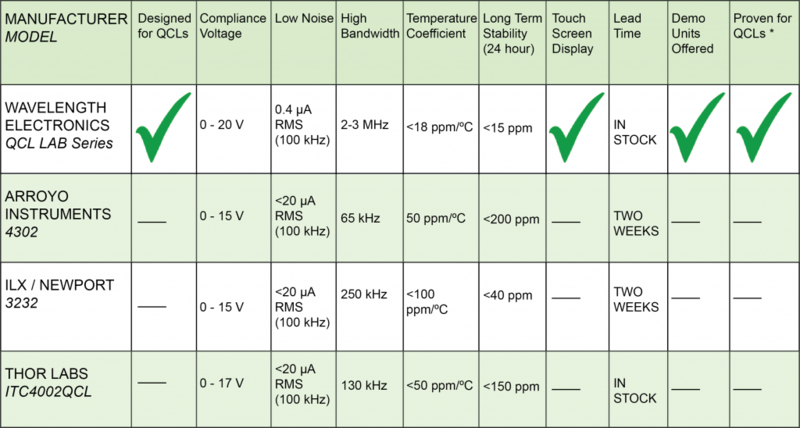 These low noise QCL driver instruments have the lowest current noise density of any commercially available. They enable lower detection thresholds in gas, liquid, and material sensing systems. 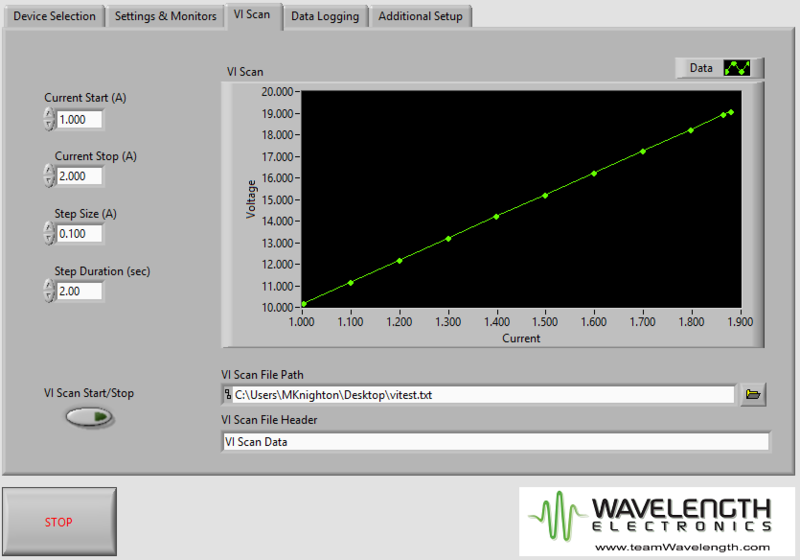 Powering a QCL with Wavelength’s patented1 driver gives you narrower linewidths, stable center wavelength, and repeatable scans. In order to maintain a characteristically tight center linewidth and minimize jitter, quantum cascade lasers must be powered by drivers with exceptionally low current noise density. Our customers have reported achieving narrower linewidths with our QCL drivers than any other they’ve used. 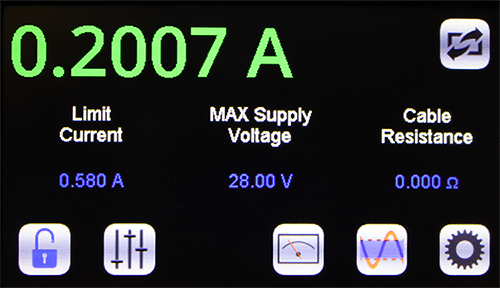 With Wavelength’s plug and play instrument, controls are set quickly using either the instrument touchscreen or a remote computer, and results are easy to monitor. This allows taking your revolutionary QCL application from the test bench to market quickly and efficiently. 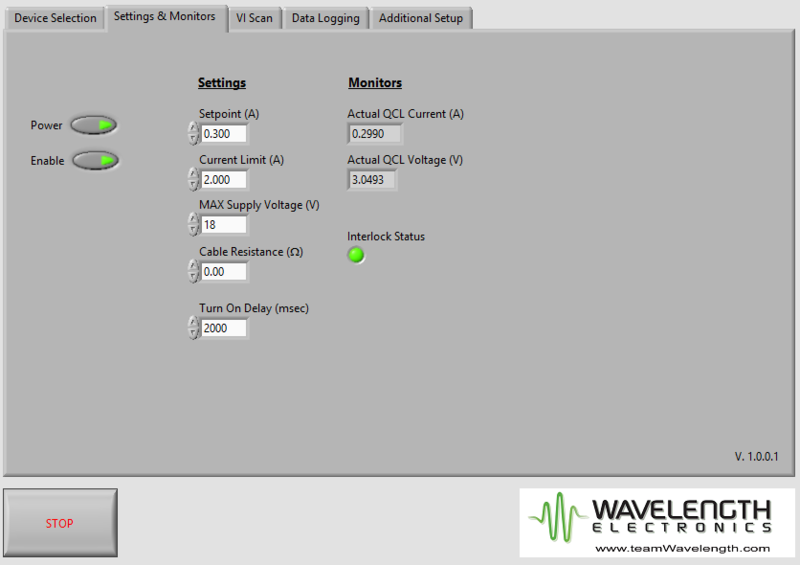 A LabVIEW Virtual Instrument application is available for remote operation. Complete installation and operation instructions can be found in the Virtual Instrument Operating Guide. You can upgrade the firmware for free to use the Command Set or VI here. If you are upgrading from version 0.79 to version 1.5+, all calibration and user data will be converted and saved. If you downgrade from version 1.5+ to version 0.79, all existing calibration data will be lost. 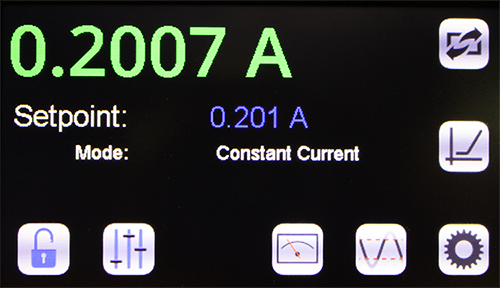 All the essential control and monitor functions expected in a Wavelength product are incorporated into this QCL driver, along with protection circuitry to safeguard the QCL from minor power source faults, over-temperature conditions, and electrical faults. Password protection available to lock out a selectable control set. An Interlock Kit, which includes a BNC terminator and modified D-SUB connector to override interlocks, is included with the instrument. Single and dual rack mount kits are available. Windows-based software also comes with the instrument. Due to their unique construction, QCLs operate with high power in the near-IR through terahertz ranges. These wavelengths are particularly suited to detection of molecules significant to humans. Applications for the lower noise QCL driver include: remote detection of explosive materials, medical diagnosis using the breath, non-invasive glucose testing, emissions monitoring of the atmosphere or marine environments, and pharmaceutical process quality control. Additional applications include anesthesia and hospital air quality monitoring, leak detection, remote imaging, and cavity ring-down spectroscopy. 1Covered by U.S. Patents 6,696,887; 6,867,644 and 7,176,755. Licensed from Battelle Memorial Institute. Noise Characterization Scan: Spectral Noise Scans are available from 1 Hz – 100 kHz. Request at time of purchase. Bandwidth: 2 – 3 MHz (CC). 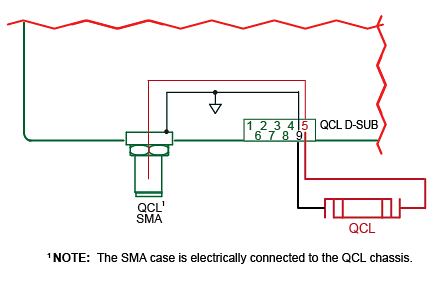 Bandwidth will depend on QCL impedance and wire lengths. Patents 6,696,887; 6,867,644 and 7,176,755. Licensed from Battelle Memorial Institute. TN-LD02: How is Current Noise Measured at Wavelength Electronics? FAQ1146: How do I upgrade my QCL LAB firmware to use the TMC Command Set and LabVIEW Virtual Instrument? 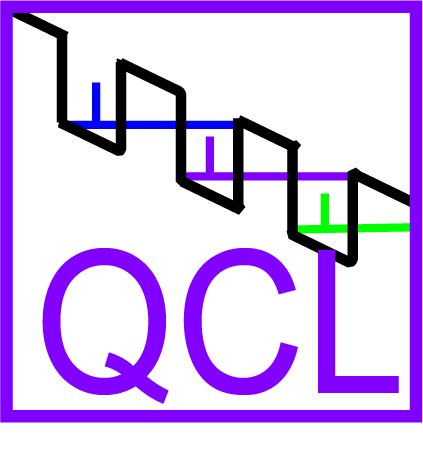 FAQ1147: My QCL LAB isn't working with the Quick Connect Application (QCA). Why? FAQ1148: My QCL LAB isn't working with the LabVIEW Virtual Instrument or the Command Set. Why? 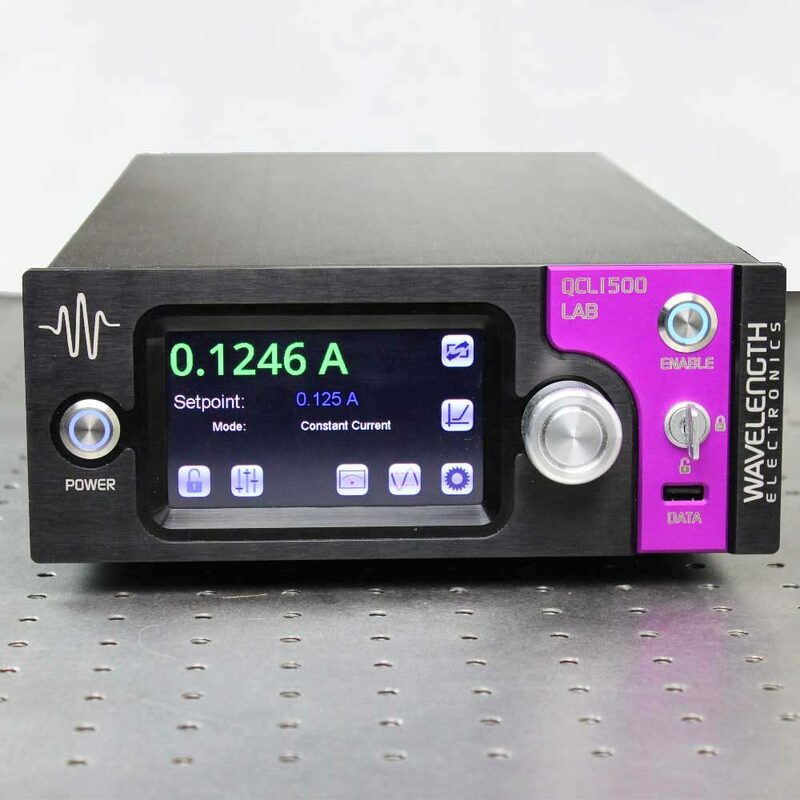 FAQ1168: Can I use the low-noise QCL LAB drivers for a non-QCL laser (for example, a blue or green laser diode)?